The recipe I followed can be found at the Blessed Hearth‘s blog (go on, check it out!) – head’s up, it’s delicious. 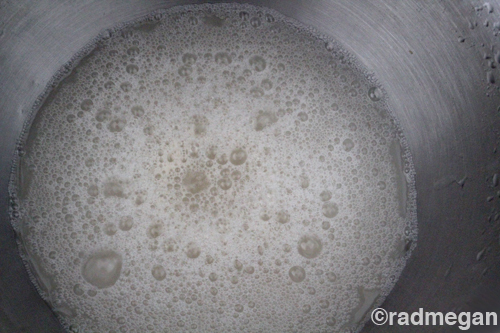 I put the water and sugar into a mixing bowl and stir well. 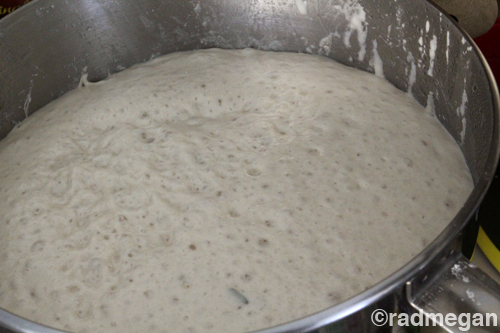 Add the yeast and stir again. Let rise for 10 minutes. Add the flour, salt and rosemary and mix well with your mixer. Cover with a damp tea towel and rise for an hour or until doubled. I wish you could smell this. Our home smelled like a hug from your favorite person when the bread was ready… and it tasted like a warm summer afternoon in Italy. …and I was so happy that I did, because even though I ended up with something that looked like a gigantic pancake, it was still delicious! 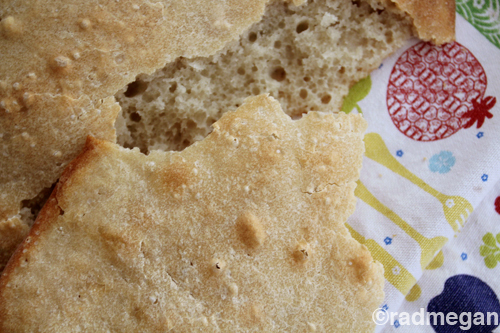 We cut up our doormat of a “loaf” into small squares and dipped it into some olive oil. Yum! In fact, when I baked this no-knead recipe the second time, I was kind of hoping it would turn into Focaccia again instead of the two perfect loaves it yielded. Sometimes accidents in the kitchen still end up being delicious! 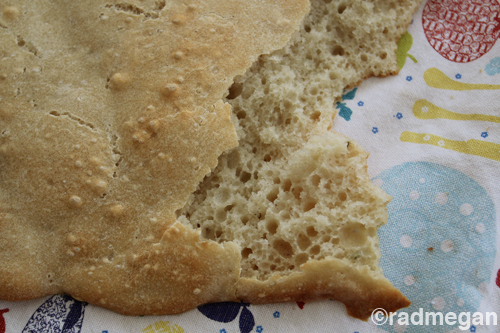 So whether you read this recipe and follow it exactly, or have one eye on your kids, dog, email… you can rest assured that no matter what the shape, this bread will still turn out yummy! Thanks again to the Blessed Hearth for the inspiration and recipe! The top round is lovely! The bread looks great for panini too- look forward to trying it! Thanks so much! There *were* two rounds, but my husband cracked into the larger of the two second after I took it out of the oven! Panini sounds like a good idea as well. Hi.. nice to meet you.. So glad you enjoyed the bread.. I must give the other a try.. smile..
Oh my, did I ruin my wonderful comment? It seems like it hasn’t been published. Anyway, I was talking about the love I have for no-knead bread and next time I bake one, I will add rosemary and see how it turns out. Have you tried letting it rise for 18 hours? It gets perfect! Hey Lady! I’m trying the recipe right now! Can’t wait for the yumminess. Should I put the rounds on a greased pan to bake? Thanks!